This week, students from the NewSchool of Architecture & Design in San Diego reappeared in Portland for the first time in six months, this time to share a district masterplan they worked on for two quarters. The Ford District open house was held at the Center for Architecture downtown. Back in October 2016, Mackenzie, along with several other local firms including Intrinsic Venture development, hosted 60 fourth-year undergraduates from the NewSchool of Architecture & Design in San Diego, Calif. for a long weekend of collaborating on a vision for Portland's Ford District, an area located on the southern end of the Central Eastside Industrial District. More than 60 undergraduate architecture students work to collaborate with industry partners to create a vision for developing a sustainable urban neighborhood with progressive urban engagement. Part of NewSchool's Integrated Design Studio, this project was developed to engage students in the ongoing conversation about contemporary direction in urban design and architecture. NewSchool's corporate social responsibility and sustainability initiative follows its slogan "Here for Good" and provides students with the opportunity to give back and improve lives with revitalization through a holistic approach. The Ford District was named by Intrinsic developer Michael Tevis — a major player in the NewSchool studio program. In 2004, Intrinsic renovated the historic Ford Building conference center, 2505 S.E. 11th Ave., a hub that sparked surrounding redevelopments into spaces that brought retailers, creatives, entrepreneurs, manufacturers and artisans to the Hosford-Abernethy neighborhood. NewSchool is NAAB accredited (National Architectural Accrediting Board) and offers construction management, product design, media design, design studios, interior architecture, architecture and design. "This class is about optimized solutions and methods, and exemplary solutions for the future of design," said Daniela Deutsch, faculty with the NewSchool of Architecture & Design. "We try to make the students understand we're coming up with new ideas of how we better design and how buildings are really fitting in this environment." Deutsch said this integrated design class has been offered for 40 years. She started coordinating this program four years ago, and designed it to be two quarters because 20 weeks gives more time to delve into the complex master plan project. "For sure this is our most challenged year because of the collaboration with the City of Portland, Mackenzie, Glumac, Intrinsic Ventures in Portland," Deutsch said. "We're looking a lot into the future of architecture and how there's this latest architectural dilemma — that we have energy-efficiency issues, rising population, lots of challenges we deal with trying to find smart optimized solutions for the building." Students worked in teams of two on 17 projects, which included park blocks, business, retail, live-work and creative micro-housing. "They come together at the beginning from the first line they draw, talk to energy consultants, city planners, and then they develop together from the first step and this is very special for architecture," Deutsch said. "Traditionally it's all about, I design it and then somebody else solves the technical problems and somebody else builds it. We want to make it nonlinear." First, she asked the students to look at the city as a whole and then move into looking at the districts. "We ended up in the district we need to study: what is this a part of? Very important is the connectivity and the community. 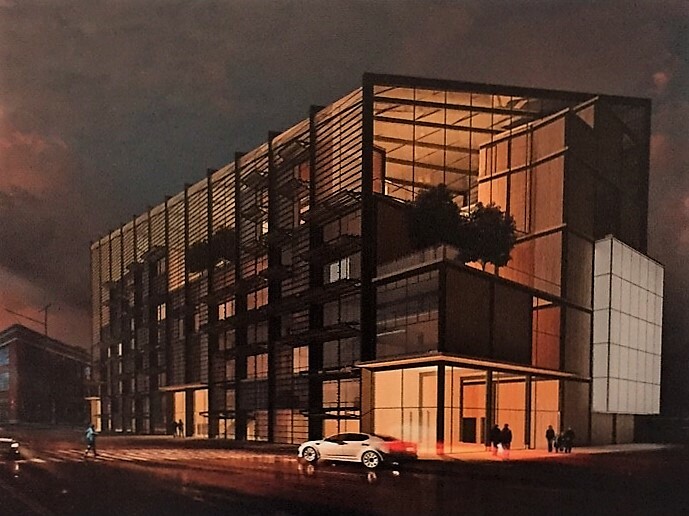 Students have to be aware how the district connects with immediate adjacencies and keep those transition spaces well-resolved — you can't have this design team in a vacuum," Deutsche said. "What kind of people are going to work and live there, and how are they going to feel? You have to look into the think cycle. If somebody works there, what do they do from morning to evening? If they don't live there, is this a place you want to come to? This is potentially a very vibrant area." Rich Mitchell, managing partner of Mackenzie, said their part as planners and matchmakers was easier than the work the students had to do. "We tried to create as real a project as possible, but large scale — a blank slate," Mitchell said. "In 10 to 15 years, something like some of these schemes might go up there." PAMPLIN MEDIA GROUP: JON HOUSE - Top: Rich Mitchell, managing partner of Mackenzie, talks about bringing NewSchool students in to re imagine the Ford District. RIGHT: NewSchool student Megan Lester talks about her team's contribution to the Ford District project. Mitchell said when the students visited last autumn, the sponsoring companies offered seminars at Mackenzie's office on land use, the history of the district, urban design guidelines and contemporary transit. "They had a wonderful mix of context to study," Mitchell said. "Neighborhood support, jobs, housing and services could really add to the work-live-play atmosphere where you can exercise, eat and all those things. Those were objectives we thought would be a great lab, a chance to study impacts on a larger scale." They used Green Globe to score each building's sustainability as they went along. "Instead of having students randomly studying sustainable strategy, we used a program that self-scores to project where they'd end up to see how far they'd take it," Mitchell. "They got to look at energy use, water use — the idea was by introducing them to a little now, they'll be able to get a jump on how architecture works in the real world." In the end, the project included coffeeshops, solar power and streets designed for collective walking. "Will they use parts of these ideas? I'm absolutely sure of it," Mitchell said. "As a collective, we all learn from projects in the past. Everybody's going to learn from it, I'm sure I'll see some things today I'll use. Turner Construction came by, I saw them looking around." Esmeralda Maldonada, a NewSchool student who worked on the Ford District design, visited Portland six months ago to look at the 10 sites and visit the rest of the city. "Then 10 sites we walked through all have a viable connection with the metro area that links right through the heart," Maldonada said. "The urban analysis we went through was actually to look at the infrastructure — the pedestrian and bike connection to the area, how everything actually connects — the majority of what we figured out is that everything is walking distance, biking distance, you don't have to be in a vehicle to get where you need to get compared to other cities." Some of the project integrated rain catchments on the walls and water treatment. "There's a lot of opportunity for sustainability here with the different seasons you guys have: the rain, the sun partially — I haven't seen any sun," Maldonada said. "Everything helps to achieve such a greater purpose of sustainability. I walked around the Pearl and there are street corners where they have wind turbines. You don't get that everywhere else." Maldonada gave a video presentation at the open house, along with fellow student Nick Kawamoto. 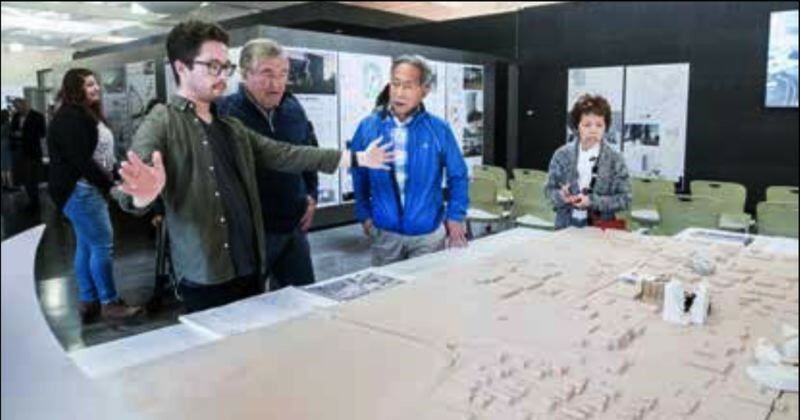 "Moving into the master plan broken down by site, students designed the massing you see here," Kawamoto said, gesturing to the 3D printed model and renderings on the posters hung in a gallery. "The massing moved into the development of projects you see on the wall today and these ranged from business, retail space, live-work, some are solely park spaces." Around 60 students participated in the two-term master class, out of 400 in the NewSchool studying architecture. "KPFF gave feedback on how this project would stand up," Kawamoto said. "Students who participated had opportunities to interact one-on-one, the ability to see feedback, what components would work well, what would need to be stronger, very plausible, but still whimsical in a way it's playful architecture to show what we could do." PAMPLIN MEDIA GROUP: JON HOUSE - NewSchool student Nick Kawamoto gives an overview of the Ford District project to the public. Along with the opportunity to interact with professionals, traveling around the city helped shape the designs. "We noticed this being an industrial area, you have the opportunity to create businesses, housing, commercial aspects, a lot of these projects try to do a live, work and play experience, keeping everything within this area so you don't have to venture out," Maldonada said. "It's something unique I believe every other city is trying to propose, as well." "People here want more collaboration, they really care about energy efficiency, it's an amazing inspiring city from this point of view, but it is still an idea," Deutsch said. "We need to move fast because we don't have much time to solve the problems we're dealing with. My deepest main thought as a teacher is let's make the right impact sooner. Buildings are not efficient and we don't have time to play with this anymore."